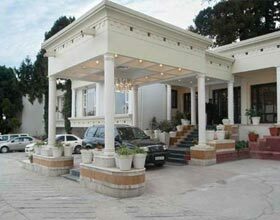 Fortune Grace Resort Mussoorie is a resplendent resort nestled in the hills of the Himalayas amidst pine forests. 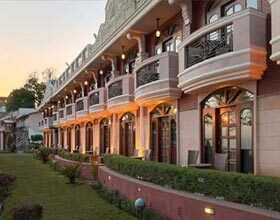 This opulent resort boasts of its exquisite location, with entrance opening into famed Gandhi Chowk near Library barrier of the Mall, the other side offering breathtaking views of the calm valley. Unblemished services, flawless staff, and cordial hospitality along with modish interiors make this resort an ideal retreat in the Garhwal province. Pine Room and Oak Room are well adorned convention center and divisible banquet of the resort organizing press conferences, corporate meets, weddings and social gatherings. Recreational centre and wellness facility including gymnasium are additional perks relished by guests abode. Hotel arranges airport transfers from Jolly Grant Airport on request. The luxury resort spread in the 32 acres along the enthralling slopes of the Shivalik has 74 elegantly designed well furnished rooms. Facilitated with all contemporary amenities, the accommodations of Fortune Grace Resort are well furnished, equipped with rich upholstery and comfortable beddings. All guest rooms and suites are classified into 25 Standard Rooms, 45 Valley View Rooms, 2 Luxury Suites and the Presidential suite, majority of them overlooks the silent Doon valley. 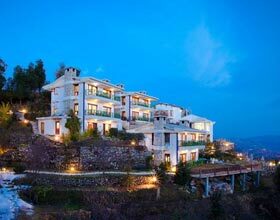 Fortune Grace Resort, Mussoorie is a gastronomic delight for lodgers, local residents and other travelers visiting this awe-inspiring hill station. Orchid serves scrumptious delicacies from regional and global fares with tranquil ambience drawn by splendid vistas of the pine rolling down the hills and the placid valley from large bay windows. Terrace is an al fresco off-shoot of the Orchid restaurant offering savory cuisines and innovative beverages with scintillating panoramic views. Chic-style bar lounge, Nostradamus is an ideal venue to snuggle down and sip the finest spirits, creative cocktails and mocktails along with finger licking canapés.